recommendations include custom therapeutic footwear for high-risk diabetic patients. Due to a lack of information resulting from any analysis of the literature relating to the care of the diabetic foot, the society for Vascular Surgery, the American Podiatric Medical Association and the Society for Vascular Medicine conducted a three year study of the relevant literature resulting in the publication of guidelines on the topic. The committee synthesised the points of view of each professional body by reviewing each others publications to produce what they describe as the ‘first ever’ guidelines of their kind. Diabetes is set to continue to affect more people world-wide. Today it’s estimated 382 million people suffer with the disorder and by 2035 that figure will increase to 592 million. The World Health Organisation predict that by 2030 diabetes will be the 7th leading cause of death. A feature of the prevalence of diabetes is the increase in limb loss. Each year over 1 million people loose a limb due to diabetes. Diabetic foot ulcers (DFU) precede 80% of diabetes related lower extremity amputations. Neuropathy, foot deformities, limited ankle range motion, high plantar foot pressure, minor trauma, previous ulceration or amputation and visual impairment are all common among among DFU sufferers. The published guidelines recommend using custom therapeutic footwear in high risk diabetic patients, including those with significant neuropathy, foot deformities or previous amputation. Firefly Orthoses offer a range of options for the treatment of patients who suffer diabetes. Our Diabetic Tridensity device is designed specifically for the high risk diabetic foot and features a medium durometer EVA arch fill. Diabetic Tridensity Orthotic We also provide orthotic device additions for deformities and amputations such as the Sulcus Crest and the Amputation Accommodation. Recommendation 1: We recommend that patients with diabetes undergo annual interval foot inspections by physicians (MD, DO, DPM) or advanced practice providers with training in foot care (Grade 1C). Recommendation 2: We recommend that foot examination include testing for peripheral neuropathy using the Semmes-Weinstein test (Grade 1B). Recommendation 3: We recommend education of the patients and their families about preventive foot care (Grade 1C). We suggest against the routine use of specialized therapeutic footwear in average-risk diabetic patients (Grade 2C). We recommend using custom therapeutic footwear in high-risk diabetic patients, including those with significant neuropathy, foot deformities, or previous amputation (Grade 1B). Recommendation 5: We suggest adequate glycemic control (hemoglobin A1c < 7% with strategies to minimize hypoglycemia) to reduce the incidence of diabetic foot ulcers (DFUs) and infections, with subsequent risk of amputation (Grade 2B). Recommendation 6: We recommend against prophylactic arterial revascularization to prevent DFU (Grade 1C). Recommendation 1: In patients with plantar DFU, we recommend offloading with a total contact cast (TCC) or irremovable fixed ankle walking boot (Grade 1B). Recommendation 2: In patients with DFU requiring frequent dressing changes, we suggest off-loading using a removable cast walker as an alternative to TCC and irremovable fixed ankle walking boot (Grade 2C). We suggest against using postoperative shoes or standard or customary footwear for off-loading plantar DFUs (Grade 2C). Recommendation 3: In patients with nonplantar wounds, we recommend using any modality that relieves pressure at the site of the ulcer, such as a surgical sandal or heel relief shoe (Grade 1C). Recommendation 4: In high-risk patients with healed DFU (including those with a prior history of DFU, partial foot amputation, or Charcot foot), we recommend wearing specific therapeutic footwear with pressure-relieving insoles to aid in prevention of new or recurrent foot ulcers (Grade 1C). Recommendation 1: In patients with a diabetic foot infection (DFI) with an open wound, we suggest doing a probe to bone (PTB) test to aid in diagnosis (Grade 2C). Recommendation 2: In all patients presenting with a new DFI, we suggest that serial plain radiographs of the affected foot be obtained to identify bone abnormalities (deformity, destruction) as well as soft tissue gas and radiopaque foreign bodies (Grade 2C). Recommendation 3: For those patients who require additional (ie, more sensitive or specific) imaging, particularly when soft tissue abscess is suspected or the diagnosis of osteomyelitis remains uncertain, we recommend using magnetic resonance imaging (MRI) as the study of choice. MRI is a valuable tool for diagnosis of osteomyelitis if the PTB test is inconclusive of if the plain film is not useful (Grade 1B). Recommendation 4: In patients with suspected DFO for whom MRI is contraindicated or unavailable, we suggest a leukocyte or antigranulocyte scan, preferably combined with a bone scan as the best alternative (Grade 2B). Recommendation 5: In patients at high risk for DFO, we recommend that the diagnosis is most definitively established by the combined findings on bone culture and histology (Grade 1C). When bone is débrided to treat osteomyelitis, we recommend sending a sample for culture and histology (Grade 1C). Recommendation 6: For patients not undergoing bone débridement, we suggest that clinicians consider obtaining a diagnostic bone biopsy when faced with diagnostic uncertainty, inadequate culture information, or failure of response to empirical treatment (Grade 2C). Recommendation 1: We recommend frequent evaluation at 1- to 4-week intervals with measurements of diabetic foot wounds to monitor reduction of wound size and healing progress (Grade 1C). Recommendation 1.1: We recommend evaluation for infection on initial presentation of all diabetic foot wounds, with initial sharp débridement of all infected diabetic ulcers, and urgent surgical intervention for foot infections involving abscess, gas, or necrotizing fasciitis (Grade 1B). Recommendation 1.2: We suggest that treatment of DFIs should follow the most current guidelines published by the Infectious Diseases Society of America (IDSA) (Ungraded). Recommendation 2: We recommend use of dressing products that maintain a moist wound bed, control exudate, and avoid maceration of surrounding intact skin for diabetic foot wounds (Grade 1B). Recommendation 3: We recommend sharp débridement of all devitalized tissue and surrounding callus material from diabetic foot ulcerations at 1- to 4-week intervals (Grade 1B). Recommendation 4: Considering lack of evidence for superiority of any given débridement technique, we suggest initial sharp débridement with subsequent choice of débridement method based on clinical context, availability of expertise and supplies, patient tolerance and preference, and cost-effectiveness (Grade 2C). Recommendation 5: For DFUs that fail to demonstrate improvement (>50% wound area reduction) after a minimum of 4 weeks of standard wound therapy, we recommend adjunctive wound therapy options. These include negative pressure therapy, biologics (platelet-derived growth factor [PDGF], living cellular therapy, extracellular matrix products, amnionic membrane products), and hyperbaric oxygen therapy. Choice of adjuvant therapy is based on clinical findings, availability of therapy, and cost-effectiveness; there is no recommendation on ordering of therapy choice. Re-evaluation of vascular status, infection control, and off-loading is recommended to ensure optimization before initiation of adjunctive wound therapy (Grade 1B). Recommendation 6: We suggest the use of negative pressure wound therapy for chronic diabetic foot wounds that do not demonstrate expected healing progression with standard or advanced wound dressings after 4 to 8 weeks of therapy (Grade 2B). Recommendation 7: We suggest consideration of the use of PDGF (becaplermin) for the treatment of DFUs that are recalcitrant to standard therapy (Grade 2B). Recommendation 8: We suggest consideration of living cellular therapy using a bilayered keratinocyte/fibroblast construct or a fibroblast-seeded matrix for treatment of DFUs when recalcitrant to standard therapy (Grade 2B). Recommendation 9: We suggest consideration of the use of extracellular matrix products employing acellular human dermis or porcine small intestinal submucosal tissue as an adjunctive therapy for DFUs when recalcitrant to standard therapy (Grade 2C). Recommendation 10: In patients with DFU who have adequate perfusion that fails to respond to 4 to 6 weeks of conservative management, we suggest hyperbaric oxygen therapy (Grade 2B). Recommendation 1.1: We suggest that patients with diabetes have ankle-brachial index (ABI) measurements performed when they reach 50 years of age (Grade 2C). Recommendation 1.2: We suggest that patients with diabetes who have a prior history of DFU, prior abnormal vascular examination, prior intervention for peripheral vascular disease, or known atherosclerotic cardiovascular disease (eg, coronary, cerebral, or renal) have an annual vascular examination of the lower extremities and feet including ABI and toe pressures (Grade 2C). Recommendation 2: We recommend that patients with DFU have pedal perfusion assessed by ABI, ankle and pedal Doppler arterial waveforms, and either toe systolic pressure or transcutaneous oxygen pressure (TcPO2) annually (Grade 1B). Recommendation 3: In patients with DFU who have PAD, we recommend revascularization by either surgical bypass or endovascular therapy (Grade 1B). Prediction of patients most likely to require and to benefit from revascularization can be based on the Society for Vascular Surgery (SVS) Wound, Ischemia, and foot Infection (WIfI) lower extremity threatened limb classification. A combination of clinical judgment and careful interpretation of objective assessments of perfusion along with consideration of the wound and infection extent is required to select patients appropriately for revascularization. In functional patients with long-segment occlusive disease and a good autologous conduit, bypass is likely to be preferable. In the setting of tissue loss and diabetes, prosthetic bypass is inferior to bypass with vein conduit. The choice of intervention depends on the degree of ischemia, the extent of arterial disease, the extent of the wound, the presence or absence of infection, and the available expertise. 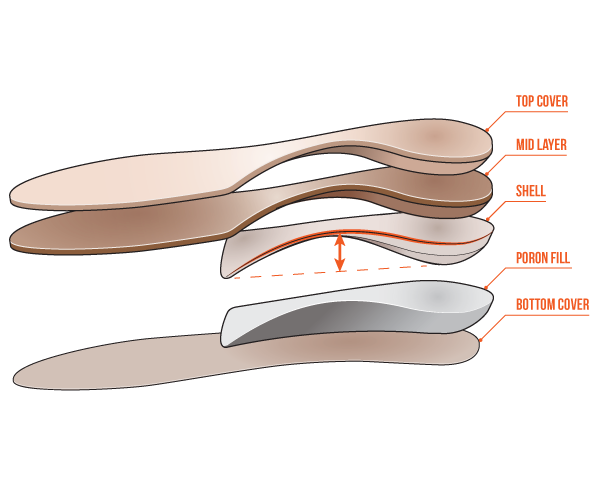 View our full range of custom made orthoses plus additions and modifications here.